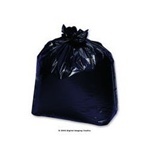 These 45 gallon - 60 gallon garbage bags fit the biggest trash cans in your restaurants and cafeterias. The are strong to hold lots of garbage and not leak. The last thing you want is to leak nasty liquids all over your floor or carpet at the end of a long day of serving food to customers. Spectrum High Density 17 Micron Natural Can Liner - 38 in. x 60 in. Spectrum High Density 12 Micron Natural Can Liner - 40 in. x 48 in. Spectrum High Density 16 Micron Natural Can Liner - 40 in. x 48 in. Natural High Density 13 Mic Can Liner - 36 in. x 60 in. Clear Coreless 55 Gallon Can Liner - 38 in. x 58 in.